The remote western site of Dhaulagiri offers some of the most demanding trekking in Nepal. Here we have the off the beaten path trek Dhaulagiri trek. The trails can be difficult following glaciers & crossing high snow-covered passes which present a challenge suited only to energetic individuals wishing to take on an adventure of a lifetime. Mt. 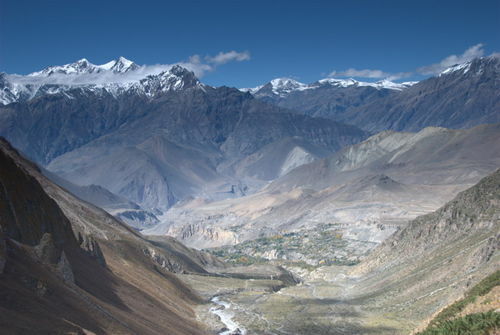 Dhaulagiri is a white mountain separated from Annapurna by Kali Gandaki gorge, the deepest gorge in the world, includes some 15 peaks above the 7000 m.
Dhaulagiri Trek is relatively strenuous but trekkers willing to spend their holidays amid nature & natural surroundings full of peace & tranquility choose this off the beaten Path trekking destination. Dhaulagiri Trekking takes you to the base camp of the world’s 7th highest mountain peak – Mt. Dhaulagiri (8,167m).